Special Containment Procedures: All buildings, private, and public land in a 10 km radius around SCP-3389 have been purchased by the Foundation and designated Provisional Site-93. All roads and pedestrian pathways leading to SCP-3389 are to be cordoned off and maintain a patrol of armed guards. An electrified chain-link fence topped with barbed wire has been erected in the immediate vicinity surrounding SCP-3389. Eight guard towers, each occupied by no less than two armed Foundation personnel and equipped with security cameras, have been erected to watch over SCP-3389 at all times. If any instances of SCP-3389-1 collapse, personnel stationed in the surrounding guard towers are to terminate any emerging SCP-3389-2 instances. No entities emerging from the lake are to reach beyond the chain-link fence. If any personnel are apprehended by an instance of SCP-3389-2, every attempt is to be made to terminate them before they can be pulled into the water. Description: SCP-3389 is a man-made lake located in the northeastern United States, near the town of ████████, Pennsylvania. Any human being entering SCP-3389 will, after a variable amount of time not exceeding ten minutes, be pulled beneath the surface of the water regardless of the depth at which they were standing. 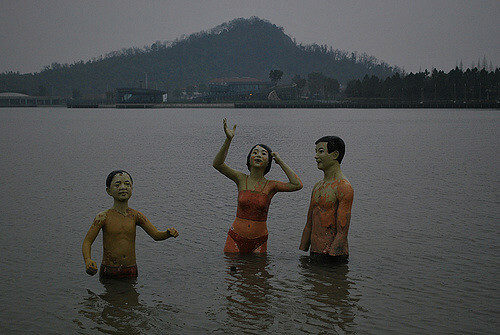 A few minutes after being submerged, a statue (hereafter referred to as SCP-3389-1) of the subject's exact likeness will rise from the water in their place. These statues are unremarkable beyond their anomalous origin, consisting of a synthetic resin and concrete mixture, and given color by standard household latex paint. Upon discovery by the Foundation, there were forty-seven SCP-3389-1 instances scattered around the lake, all in various states of decay. Thirteen remain, including that of Doctor ████████ (SEE TEST-LOG 3389-D-4). It is currently unknown how many instances were present prior to containment. Subjects pulled beneath SCP-3389’s surface re-emerge as instances of SCP-3389-2. Instances of SCP-3389-2 surface from the water through an instance of SCP-3389-1, which will collapse moments prior. Their bodies are disfigured in a manner consistent with that of burn victims to variable degrees. Instances of SCP-3389-2 bear a physical resemblance to the instance of SCP-3389-1 through which they surfaced, as well as the subject whose appearance is replicated by said SCP-3389-1 instance. Once they have surfaced, the entities will begin moving towards the shoreline. SCP-3389-2 entities will then attempt to retrieve subjects and bring them back into SCP-3389, in order to facilitate the creation of more instances of SCP-3389-2. Addendum 3389-A1: Due to the unpredictable nature of SCP-3389-2 instances (SEE INTERVIEW LOG 3389-S1 and TEST LOG 3389-D4), they are to be seen as hostile and treated as such. Addendum 3389-D4: Due to initial failure in testing, further experiments on SCP-3389 have been barred by order of O5 Command. (SEE TEST LOG 3389-D-4). Note: SCP-3389-2-1 is the first SCP-3389-2 entity to have emerged from SCP-3389. Its body is disfigured beyond recognition, to the point that vocalization of any kind should not be possible. Despite this, SCP-3389-2-1 was perfectly capable of speech. SCP-3389-2-1 emerged from the lake near the shoreline. Personnel were alerted, and met the entity near the fence. Initially, SCP-3389-2-1 was unresponsive, speaking incoherently and attempting to get past the gate, injuring itself in the process. When personnel attempted to communicate with SCP-3389-2-1, It is severely burned, including damage to the throat and vocal cords. However, it is still able to vocalize. Dr. Albright: SCP-3389-2-1, do you know where you are? SCP-3389-2-1: It's been so long.. I can't see, can only feel..
Dr. Albright: Only feel? What is it you feel? SCP-3389-2-1: The water! It makes demands.. burns me until I give it what it wants, but I refused! SCP-3389-2-1 falls to the floor onto its knees seemingly struggling to stand. It attempts to speak further, but only produces soft wheezing noises. Dr. Albright: SCP-3389-2-1, are you alright? What's happening? SCP-3389-2-1: This is its.. punishment.. for disobedience.. but it is a release..
SCP-3389-2-1 looks up to Doctor Albright briefly before collapsing fully onto the floor, turning to ash moments later. Dr. Albright: Make a note of that, and keep an eye out for any more. Testing Procedure: D-81732 was instructed to enter SCP-3389. Approximately four minutes and eleven seconds after entering the water, consistent with averages from prior tests, subject was pulled beneath the surface. SCP-3389-1 instance rose from the water a brief moment later. Research Team ordered to monitor SCP-3389-1 instance tied to D-81732 in case it collapsed. Approximately three months later, the SCP-3389-1 instance representative of D-81732 collapsed, and a new SCP-3389-2 instance (SCP-3389-2-7) emerged near the shoreline. Log begins after initial contact, once Doctor Albright and her research team have passed through the chain-link fence accompanied by armed personnel. Note: SCP-3389-2-7 is the seventh SCP-3389-2 instance to have emerged from SCP-3389 since containment began. SCP-3389-2-2 through 6 all collapsed in a similar manner to SCP-3389-2-1 before any new or noteworthy information could be extracted. Dr. Albright: D-81732? Do you know where you are? SCP-3389-2-7: Doctor? I-is that you? Dr. Albright: Yes, yes it's me! D-81732, this is Doctor Albright. Can you tell me what happened to you? SCP-3389-2-7 begins to act erratically. It faces Doctor Albright and begins to approach her. Dr. Albright: D-81732, can you hear me? I need you to tell me what happened! SCP-3389-2-7 continues to move towards Doctor Albright, ignoring her questions and gradually picking up speed. Research Team begins to back away as security personnel ready their weapons. SCP-3389-2-7: A flame needs fuel and the water calls for you! A flame needs fuel and the water calls for you! SCP-3389-2-7 repeats this phrase without pause, backing the research team up to the fence. Doctor Albright orders security personnel not to fire until the last possible moment. Dr. Albright: D-81732, I need you to speak more clearly. I need you to tell me what that means. SCP-3389-2-7 ceases its repetition, but continues to approach Doctor Albright. As the entity reaches a meter from the nearest personnel, it dives forward and grapples onto Doctor Albright. Security personnel ready their weapons once more, but hold their fire at Doctor Albright's command. SCP-3389-2-7 begins to pull her back towards SCP-3389. SCP-3389-2-7: The red sea is only red because of the fires burning beneath the waves! Doctor Albright struggles, pleading with SCP-3389-2-7 to release her. The entity ignores her, continuing to repeat the same phrase as it pulls Doctor Albright up to the shoreline. Dr. Albright: What are you doing? What is this? SCP-3389-2-7: The beginning of my redemption! I have chosen my path, and it will be my salvation! SCP-3389-2-7 throws Doctor Albright into the water. Entity is immediately fired upon by security personnel, and is terminated. Doctor Albright begins to stand and make her way out of the water, but is pulled beneath the surface. NOTE: The amount of time it took for Doctor Albright to be pulled beneath SCP-3389's surface was significantly shorter than has been recorded in prior tests. The reason for this, as well as its significance, is currently unknown.